The daily routine of a mediaeval canon at Thurgarton Priory was punctuated by the divine offices – Matins at midnight, Lauds at dawn, Terce at mid-morning, Sext at mid-day, None at mid-afternoon, Vespers in the evening and Compline around 9pm. In addition the brothers would celebrate Mass at least once per day at the high altar and at the many side altars where prayers and masses would be said for patrons and their families. The celebrations of Easter, Christmas and the numerous other high days and saint’s days in the church’s calendar meant even longer periods of prayer and worship. Throughout the many long hours spent in these services the canons remained standing – a life of devotion may have been uplifting for the soul but was undoubtedly burdensome for the legs. 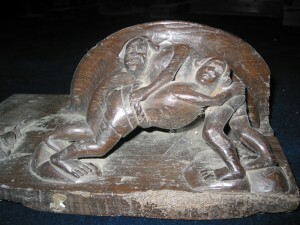 The mercy seat or misericord was a choir stall with a hinged seat which when raised provided a ledge on which the infirm or elderly brother could perch and take the weight off his legs but still appear to be standing. 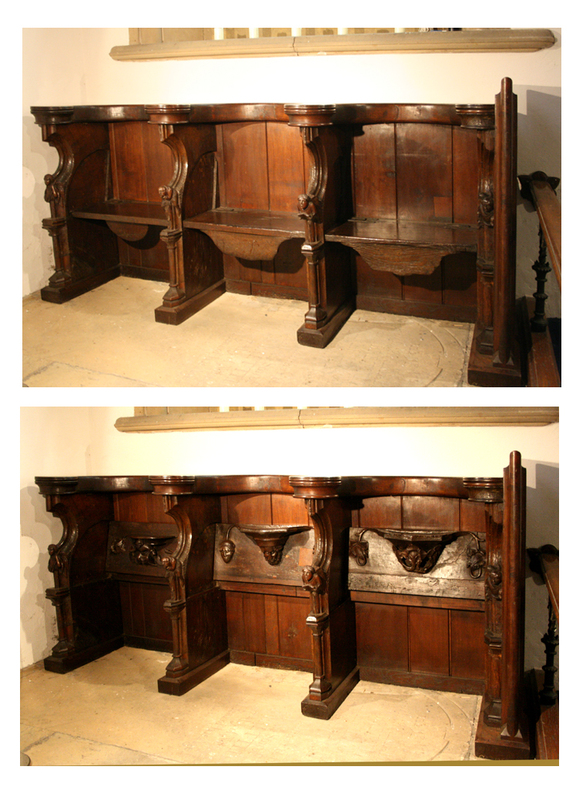 15th century misericords from Thurgarton Priory – seat down and seat raised. 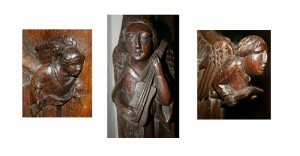 A wealth of mediaeval carved figures adorn the underside of misericord seats. Favoured subjects included biblical scenes, saints lives, popular fables and morality tales, animals real and mythological, and numerous scenes from everyday life. 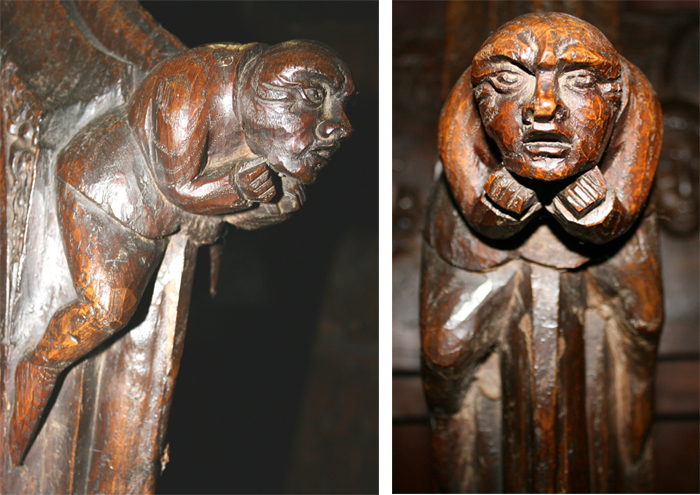 All aspects of the mediaeval world can be found in these carvings from ribald humour and satirical commentary to lessons in morality and visions of the sacred – from the farmyard to the gates of heaven. 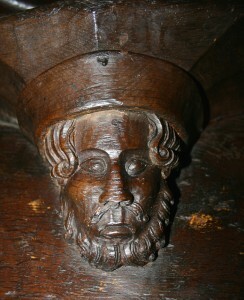 Central seat – face with beard , moustache and hat flanked by two faces. 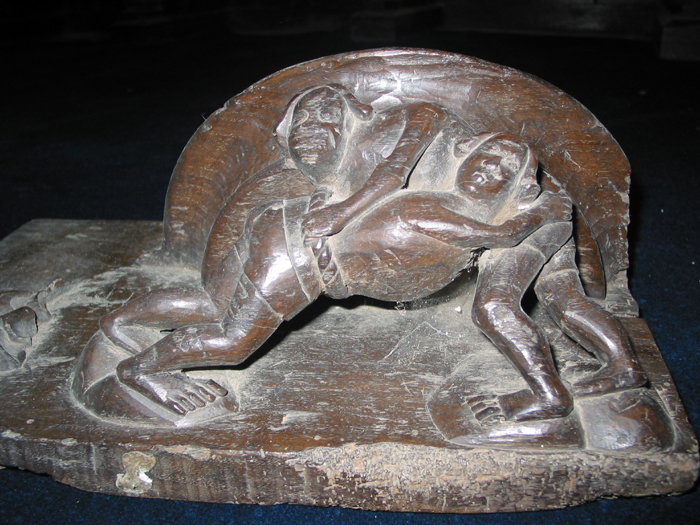 A separate fragment of a misericord seat survives which depicts two wrestlers who bear a remarkable similarity to Cumberland wrestlers. Although somewhat crudely carved these figures have a directness and energy. 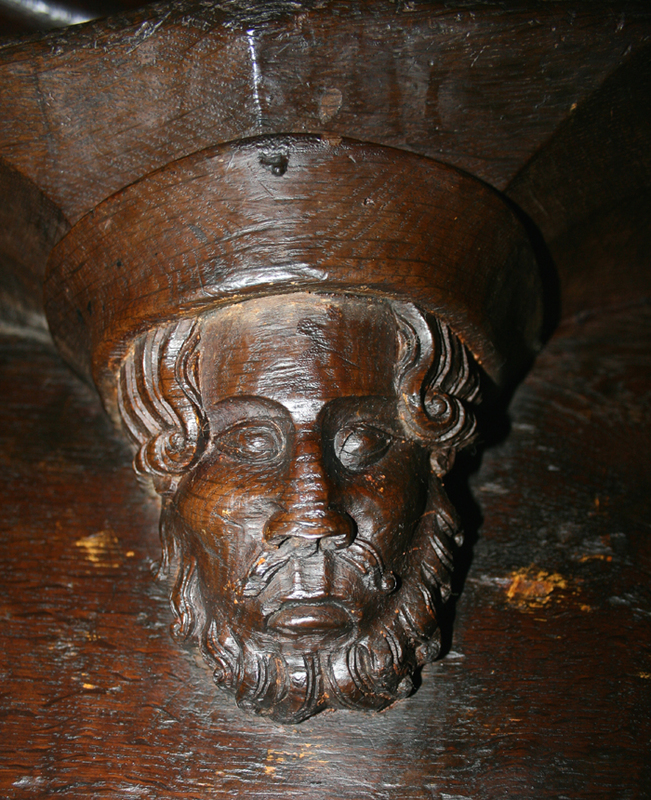 - close up one could be face to face with a canon or a master mason? The seat on the right with foliage has the look of the Art Nouveau, sort of Archibald Knox in style. Could this also be a Victorian design?